RANI has been the winner, or runner up, in various regattas, including first over the line in the racing division in 2005 ARC and second overall on handicap. She has sailed the 2008 Palma-Vela and done well. 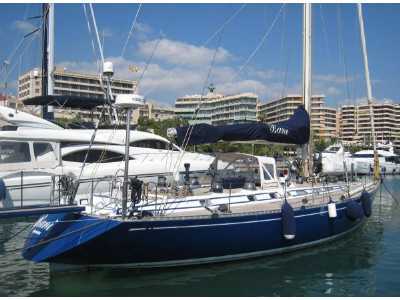 In July / August the owner enjoyed a family cruise on board, visiting Sardinia and France - the yacht then returned to Palma. 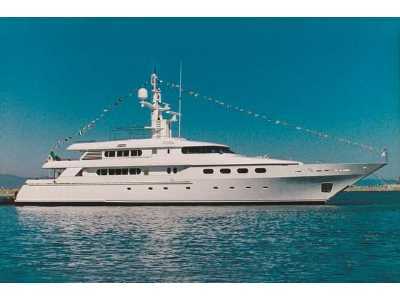 RANI is maintained to a high standard and in the past few years there have been many upgrades and improvements made. German registry. VAT paid status. Teak deck by renewed “Teak Deck Systems” in 1996, and was refitted in 2003. Underwater hull given new epoxy coatings Oct 2005. Last anti-fouled March 2007. Lofrans Falcon electric anchor windlass mounted in forepeak recess. Single roller at the bow. An Anderson Power Pack system has also been added to drive the hydraulic winches and the headsail furler, (this unit is installed in the fo’csle). Many winches have been upgraded to the next larger size (over standard). Large owner’s stateroom aft with centreline queen-sized bed with ensuite toilet and shower. Upper / lower single berths in cabin to starboard aft of the navigation area. Engine room access from the passage way. Tool storage. Navigation area with chart table, seat, electric panels, instruments, drawers and locker. 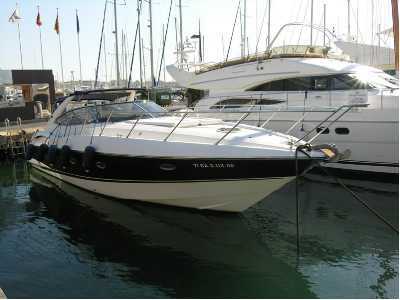 Fully equipped spacious galley to portside of engine room. Saloon : The starboard pilot berth in the main saloon has been removed and the U shaped settee has been moved further outboard. Large dining table. Bookshelves and space built-in for TV, VCR and stereo above the starboard side. 2 x upper/lower single bed guest cabins forward, both with own facilities. Forepeak with storage and crew cabin. Top and front load refrigerator and top load freezer with baskets (Frigoboat system - 220 v AC and compressor off main engine), 2006. Loewe LCD TV and new stereo with loudspeakers throughout inside and outside, with individual volume control, 2006. Connected to entertainment PC. Generator: 12kW Northern Lights with sound enclosure and dry exhaust system, unit installed in the engine room. The unit was newly installed under previous ownership, exact hours are not know as the hour meter was not replaced. Air conditioning: 36000 BTU/H (completely overhauled in 8/2006), new compressors, circulation pump and fan coils, pressure tank added. Two units installed in the engine room. new starting batteries and new radio batteries, 2008. Mastervolt 24/2000/60 Inverter and Mastervolt charger, (both installed portside behind settee). New chargers (06/06) for Radio and Starter Batteries - Dolphin 12v/20A & Promatic 24v 35 marine charger, installed starboard side behind sofa. on the Navigation PC screen. Samsung SyncMaster 173vt 17” PC touch screen at chart table. Sloop rigged, Nautor spars. Mast with double spreaders. A racing forestay is also available. North Genoa No 3 102%, Aramid 2004.